Use dwtfilterbank to create a discrete wavelet transform (DWT) filter bank. 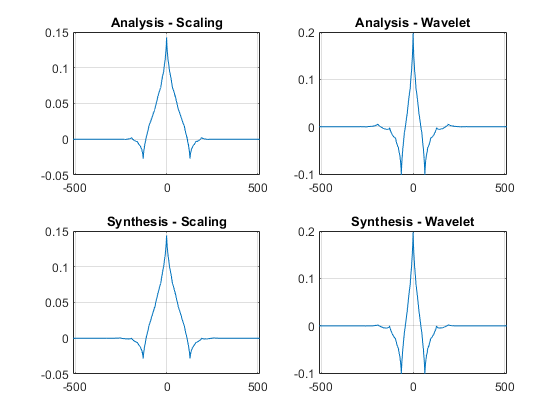 With the filter bank, you can visualize wavelets and scaling functions in time and frequency. You can measure the 3-dB bandwidths of the wavelet and scaling functions. You can measure the energy concentration of the wavelet and scaling functions in the theoretic DWT passbands. You can determine if the filter bank is orthogonal or biorthogonal. You can also determine the frame bounds of the filter bank. You can create a filter bank using your own custom filters. fb = dwtfilterbank create a discrete wavelet transform (DWT) filter bank. The default filter bank is designed for a signal with 1024 samples. The default filter bank uses the analysis (decomposition) sym4 wavelet and scaling filter with seven resolution levels. fb = dwtfilterbank(Name,Value) creates a DWT filter bank fb with properties specified by one or more Name,Value pair arguments. Properties can be specified in any order as Name1,Value1,...,NameN,ValueN. Enclose each property name in quotes. You cannot change a property value of an existing filter bank. For example, if you have a filter bank fb for the sym4 wavelet, you must create a second filter bank fb2 for the coif5 wavelet . You cannot assign a different Wavelet to fb. Signal length, specified as a positive integer greater than or equal to 2. Name of wavelet, specified as a character array or string scalar, used to construct the filter bank. Wavelet is an orthogonal or biorthogonal wavelet recognized by wavemngr or Custom. To use a wavelet filter not recognized by wavemngr, set the Wavelet property to Custom and specify the CustomWaveletFilter and CustomScalingFilter properties. Wavelet filter type, specified as one of 'Analysis' or 'Synthesis'. 'Analysis' uses the decomposition filters returned by wfilters. 'Synthesis' uses the reconstruction filters. Wavelet transform level, specified as a positive integer less than or equal to floor(log2(SignalLength)). By default the level is equal to floor(log2(SignalLength/(L-1))) where L is the length of the wavelet filter associated with Wavelet. For wavelets recognized by wavemngr, this is equivalent to wmaxlev(SignalLength,Wavelet). If floor(log2(SignalLength/(L-1))) is less than or equal to 0, Level defaults to floor(log2(SignalLength)). Sampling frequency in hertz, specified as a positive scalar. If unspecified, frequencies are in cycles/sample and the Nyquist frequency is ½. Custom wavelet filter coefficients, specified as a real-valued column vector or matrix. CustomWaveletFilter must be an even-length column vector for an orthogonal wavelet or a two-column matrix with an even number of rows for a biorthogonal wavelet. This property applies only when Wavelet is set to 'Custom'. Custom scaling filter coefficients, specified as a real-valued column vector or matrix. CustomScalingFilter must be an even-length column vector for an orthogonal wavelet or a two-column matrix with an even number of rows for a biorthogonal wavelet. Create a DWT filter bank using default values. Plot the magnitude frequency responses of the wavelets and coarsest-scale scaling function. Open the plot in a separate figure window. The plot legend in the window is interactive. To hide a particular frequency response, click on its name. 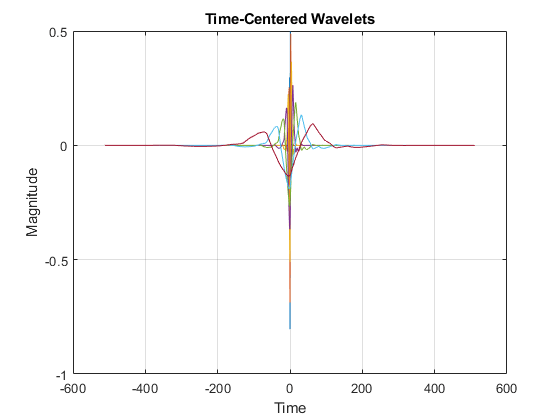 Obtain and plot the time-centered wavelets corresponding to the wavelet bandpass filters. This example shows how to create a DWT filter bank using custom biorthogonal wavelet filters. Two pairs of analysis (decomposition) and synthesis (reconstruction) filters are associated with a biorthogonal wavelet. Each pair consists of a lowpass and highpass filter. Specify the analysis and synthesis filters for the nearly-orthogonal biorthogonal wavelets based on the Laplacian pyramid scheme of Burt and Adelson (Table 8.4 on page 283 in ). Because the toolbox requires that all filters associated with a biorthogonal wavelet or an orthogonal wavelet have the same even length, the filters are prepended and appended with 0s. Hd and Gd are the lowpass and highpass decomposition filters, respectively. Hr and Gr are the lowpass and highpass reconstruction filters, respectively. Construct analysis and synthesis DWT filter banks using the biorthogonal filters. Confirm the filter banks are biorthogonal and not orthogonal. Obtain the wavelet and scaling functions of both filter banks. Plot the wavelet and scaling functions at the coarsest scales. Compute the framebounds of the two filter banks. Since the filters are associated with biorthogonal wavelets, the framebounds will not equal 1. 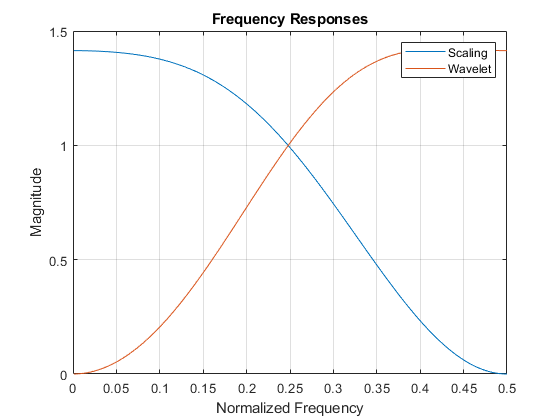 Obtain the frequency responses of the scaling and wavelets filters in the analysis filter bank. Plot up to Nyquist the magnitude frequency responses of the scaling and wavelet filters at the finest scale. Zoom in and confirm the magnitude frequency responses at the point of intersection are not magnitude equal to 1. 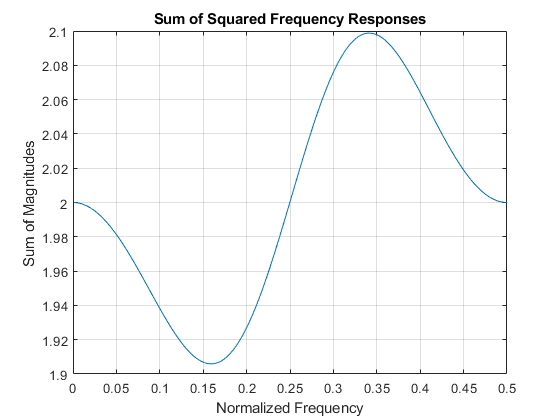 Plot the sum of the squared magnitudes of the frequency responses. Because the scaling (lowpass) and wavelet (highpass) filters do not form an orthogonal quadrature mirror filter pair, the sum does not equal to 2 at all frequencies.